Friday Recap 3/9: All Things People’s Fair | All Things People's Fair! We have some great sponsors for UMX 2012! If you are on Facebook or Twitter, please Like our sponsor pages, follow them and support their amazing companies! They make what we do possible! Thank you so much to Bender’s 13th Ave Tavern, 99.5 The Mountain, Fox31 News, Miller Coors, Panera Bread, The Onion, Pepsi, Steve’s Snappin Dogs, Dog House Music, and Happy Llama! 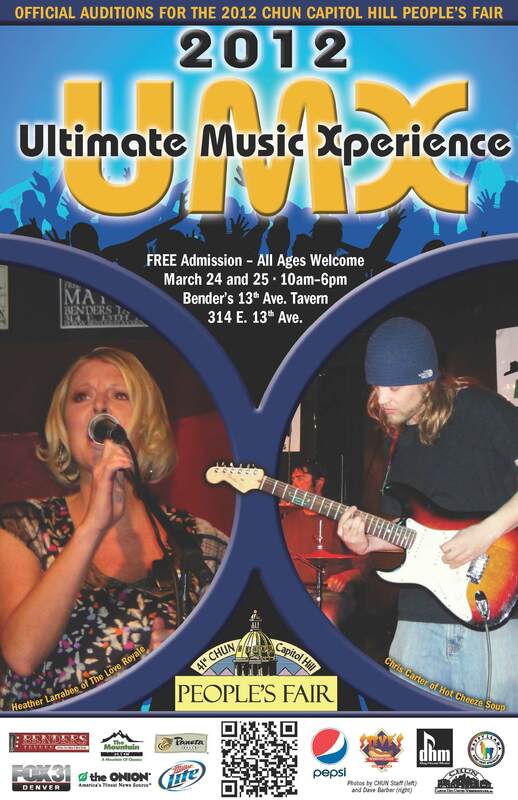 We will be doing Spotlights on a few musicians that will be performing at UMX live auditions. Look out for spotlights on Caleb Slade- formerly of Colorado’s own the Fray, Emma Henry – a 17-year-old young lady who auditioned for American Idol, The Foot – a band that has received a lot of talk on Facebook, and Take to the Oars- a Colorado rock band that has been seen sharing the stage with numerous big name acts! We are getting so excited for the upcoming weeks! Stay tuned and stay involved…..